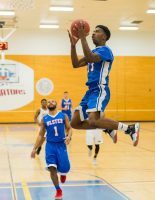 Tyreik Johnson of the Ulster County Community College’s Men’s Basketball team is the Mid-Hudson Conference Athlete of the Week. Ulster moved to 17-9 and one game away from Nationals with the victory. The loss dropped Lackawanna to 24-5 and it was their first home loss of the season.